is There a way to make VirtualKeyBoard class takes my customized screen without adding my screen to skin.xml? Please come to the thread Persian Prince listed and talk to me about what you want / need. I can try to accomodate your needs. I assume that "historylist" is something that you are adding to the basic VirtualKeyBoard functionality? Please explain what you are trying to achieve. It is different subject from the Persian prince mentioned as that for adding language and my problem not with adding language..
problem that in my example code above that the my screen and the history list are not displayed and the defualt image virtual keyboard screen displayed instead. 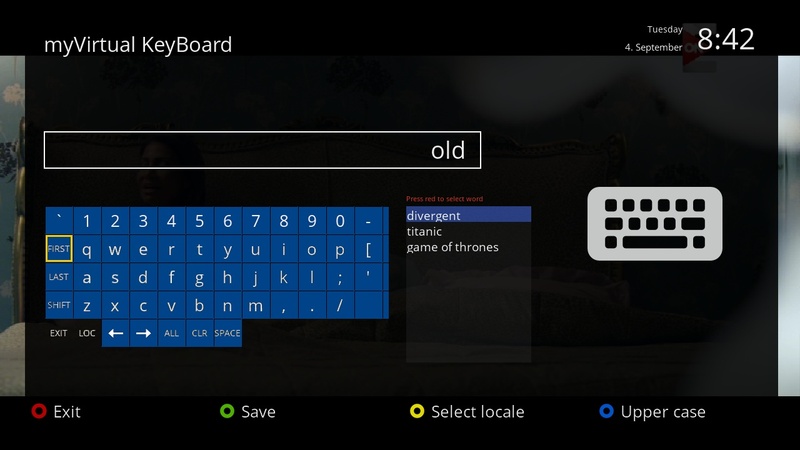 is There way to make enigma or skin.py to display my local screen instead the image default virtual keyboard screen? Edited by mfaraj57, 3 September 2018 - 08:38. It's better to merge this thread into https://forums.openp...ance-requested/ and rename the original thread from "Language assistance requested..." to "The new Virtual Keyboard and all its discussions"
Edited by Persian Prince, 3 September 2018 - 08:45. Don't be blocked by the thread title which is wrong since a very long time now... this is rather now the thread to debug all issues around new VirtualKeyboard. This forum does not allow posts to be edited (after a few minutes) so I can't do anything about the thread title. Still changes to VirtualKeyBoard would be better discussed where the others are following the conversation. If you are subclassing the new VirtualKeyBoard why don't you call the VirtualKeyBoard "__init__" from your "__init__" and then change the screen name and then provide your own custom code and screen to deliver the functionality you want. 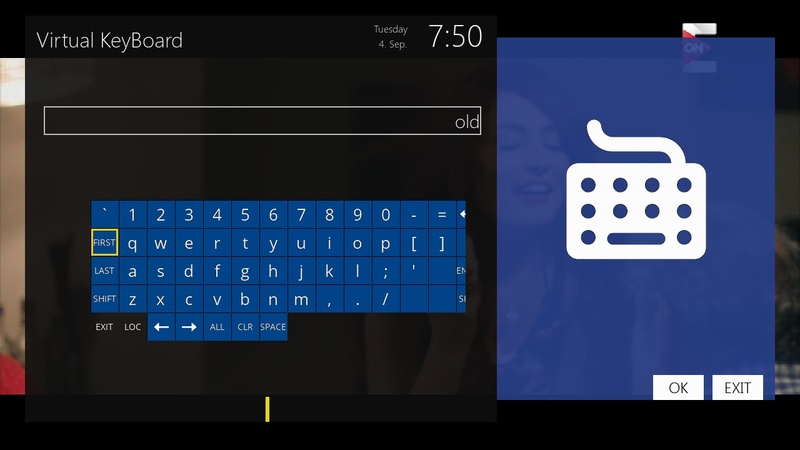 Just use the new VirtualKeyBoard to do the heavy lifting on the main display and input code. Edited by IanSav, 3 September 2018 - 11:35. @mfaraj57 to use your screen, you need to call your class in a different, as your screen. After the description, I think that you want to do the same thing as I am in my plugin youtube. I use 'prompt' or 'header' in other images for suggestions that have been updated by function okClicked. Of course, this text is not selectable. I think you suggested same idea about importing VirtualKeyBoard class to my customized class. This way is good if i want to use virtual keyboard in my plugin but i do need this,i want to edit virtual keyboard screen in the system file Screens.VirtualKeyBoard.py and keep the file name as it is also the name of class VirtualKeyBoard. But your suggestion make me to think to do in opposite way by importing my screen class to virtualkeyboard class. If you edit the screen in your image, I do not see any problems for the changes. Only you need to change the skin in skin_default.xml or in skin_user.xml, instead of adding another in screen . Edited by Taapat, 3 September 2018 - 16:52. For some irrelevant reasons i cannot edit or change skin.xml or skin_default.xml and if i can edit will no problem a all. I assume that skin.py takes the class name and looks for screen with same name in skin.xml if found one then assign it to class and ignores any local request at module level to change the screen. So according to this the only way to disrupt this process by changing the name of the class as in our case from VirtualKeyBoard to myVirtualKeyBoard as example. Edited by mfaraj57, 3 September 2018 - 18:17.
as skin name, so after this change it will search for myVirtualKeyBoard and will not find it. Edited by samsamsam, 3 September 2018 - 21:34. I am not exactly sure about what you are trying to do but I hope I miss-read that you want to change the actual VirtualKeyBoard.py? Edited by littlesat, 4 September 2018 - 06:37. Edited by mfaraj57, 4 September 2018 - 06:45. You miss my point to skin_user.xml. You can create in folder /etc/enigma2 file skin_user.xml, where you can replace any screen without additional hacks in sources. A hack with strealing a class is so brrrr.. I remember this was mandatory in the far past to be able to create plug-ins on DMMs code. But here someone add a list of Words to the keyboard... the w is here why is this not possible (anymore)... what is required for it to make what we have compatible or what is needed to get the other keyboard compatible... sounds someone search for a solution and took the quick, dirty, hacky part. Edited by littlesat, 4 September 2018 - 07:18.